Not Live Blogging Lincoln - A round for the ages. We started the day at Sharp, but after learning that the greens were being aerated with 7 temps we decided to go to Harding. Missed the turn off for Harding, so wound up at Lincoln. Net net, best round ever. Apparently, god wanted us to play Lincoln. Broke 90 for first time, beat the Other Mike, and finished with the same ball I started with. A round for the ages. Those who can - dive. Those who can't - go shopping for wetsuits. With Rick O at Bamboo Reef, gearing up for abalone. He needs a new wet suit. I need a new tube cover. Now all we need are decent conditions. Kim was great help at a great store and local resource. Then over to The Brickhouse for a Ninkasi Oatmeal Stout on tap with a fish and chips sandwich. Here we continued to talk more about diving as opposed to - you know - actually diving. We'll get there eventually. Our building merited a feature in the Sunday Chron from architectural critic John King. This from a recurring series highlighting buildings and architecture that King finds worthy of note. We've been living here over 20 years, and over that time the tone of local architectural critics (amateur and pro alike) has softened considerably. I recall a column from the late great San Francisco columnist Heb Caen where he referred to The Summit as a "beast of building". Even now, John King seems a bit conflicted, simultaneously describing the building as "serene", sculptural" and "intrusive". Make up your mind John. 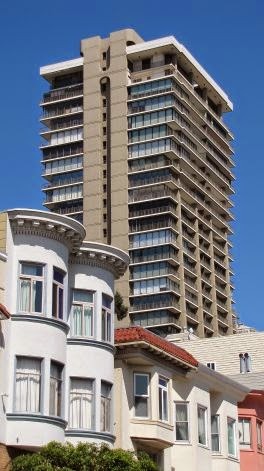 Urban buildings exist in two realms, the heavens and the earth, and Russian Hill's tallest tower shows the potential tension well. 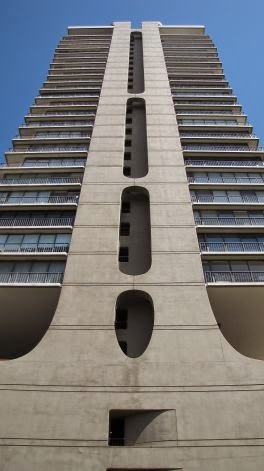 Developer Joseph Eichler wanted to stack views upon views, and he did so with a flared shaft of concrete and glass at once sculptural and serene. But the impression down low is blunt, the historic setting serving as little more than a launch pad. Now the hill has a 40-foot height limit, leaving Eichler's aerie on its own - still intrusive, but letting us admire the architectural drama without fearing what might come next. Of course, the best way to view our building is from the inside looking out. Just me and the Other Mike for a mid-week afternoon round. The sun occasionally popped through, but mostly cloudy and cool with a little light fog just off the deck (the bridge is in the fog behind us in this pic).We pretty much had the course to ourselves. A good day to golf. Bad start. Bad finish. But some good holes in the middle and a string of 3 pars in a row. 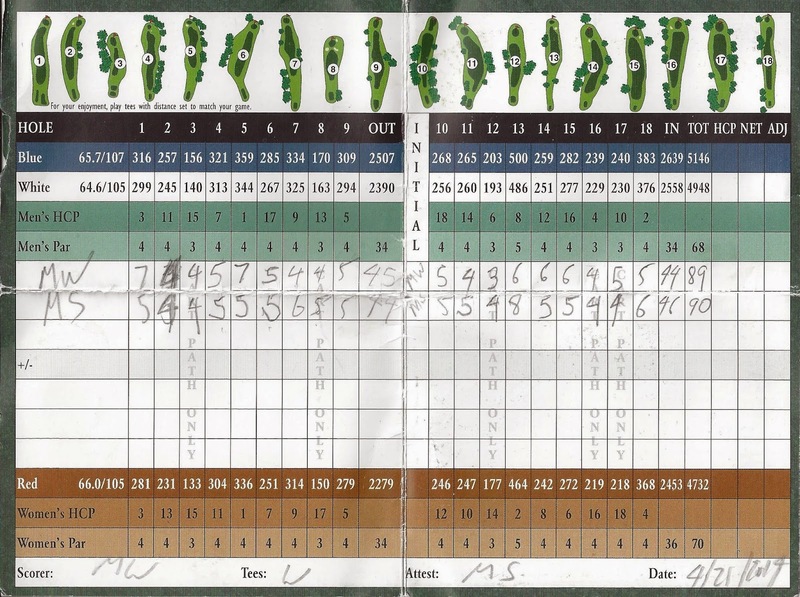 It was enough to post a sub 100 round and erase the memory of my weekend score. ... were bad. Although I marginally improved on the back, not breaking 100 at Lincoln is always a disappointment. For the second straight outing, the Bad Golfers succeeded in dragging single digit handicapper Brad down to our level. Still - the conditions were so great, and the course in terrific condition (for Lincoln), and it was such fun day, that is almost made up for the scores. Almost. 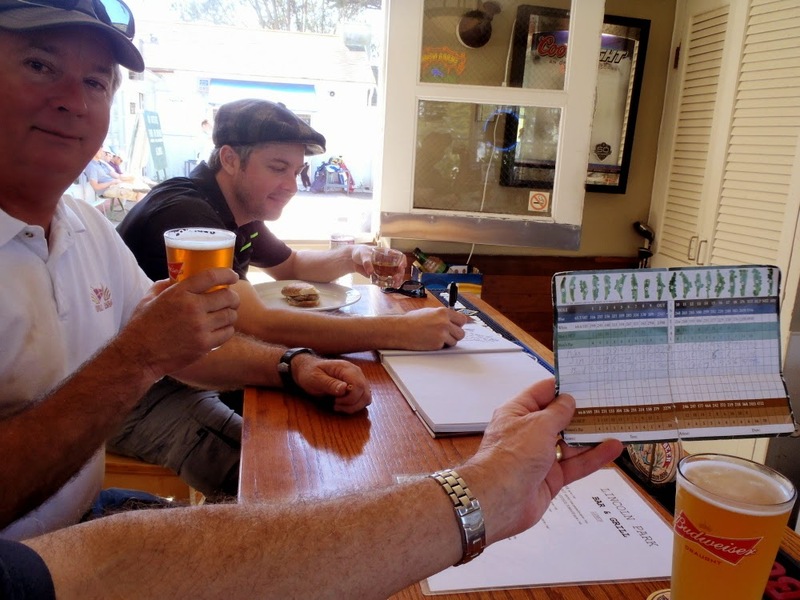 "Alister Mackenzie's Legacy of Public Golf at Sharp Park"
A great day of bad golf. Fantastic day on the course, although my score did not reflect it. The phone is out of juice. Last pic until I get home. ... from the 17th tee. I think he got there. Brad launches one between the tree and over the hill. Given I was 1 over after 3 holes, this was a pretty disappointing front 9. I think they call this "reversion to the mean". Jim missing birdie putts on seven and eight..
... but he got both pars. ... on the sixth tee. ... into the crap on the right side of the 4th fairway. With Jim and Brad. Not shown are two unreliable golfers who cancelled at the last minute late last night. They were concerned about the half marathon running by the course this morning. Which, as it turns out, was no problem whatsoever. This may be the best day at Lincoln ever. The weather is spectacular. Let that be a lesson to all you unreliable golfers out there. They're down there laughing at me. In the Spring an old man’s fancy turns to thoughts of abalone. Okay. So it doesn't actually rhyme unless you mispronounce abalone. Deal with it. It's that time of year. The opening of the abalone season is upon on us. But it doesn't look like anyone in their right mind will be doing any abalone diving today. Pacific Waverider has a 12 foot northern swell and a 5 foot southern swell. Which tells me my favorite cove is pretty much a zero visibility washing machine. This year's opening is looking more like 2012 or 2011 than last year's benign conditions. The forecast through the weekend does not look much better. I'll be waiting for conditions more amenable to my advanced age before venturing in, and hope any divers that risk it manage to stay safe this week. The previous annual limit was 24. 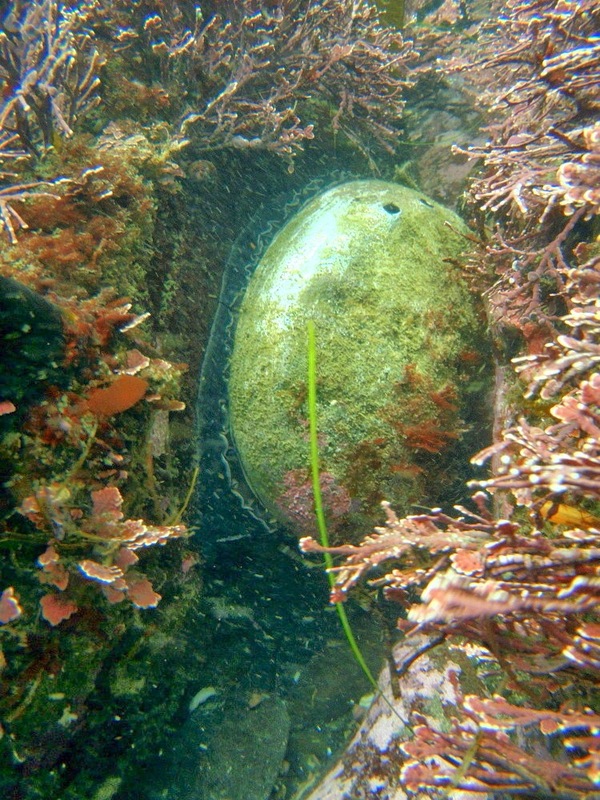 The daily catch limit remains at three abalone, along with the minimum size of seven inches. Also new for the season opening April 1 is an 8 a.m. start time, nearly three hours later in midsummer than the previous start time of half an hour before sunrise. Biologists were initially stumped by the die-off, which stunned local divers and was erroneously attributed to a red tide. 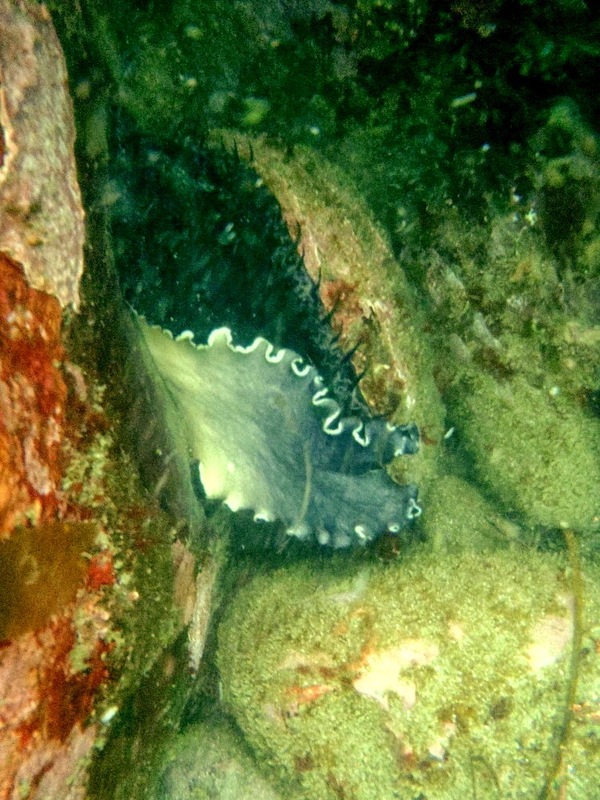 The cause has since been identified as a bloom of microscopic algae called Gonyaulax membranacea, which produce a toxin called yessotoxin that was found in abalone gut tissue. No similar algae bloom has occurred since 2011, Rogers-Bennett said." If there is a problem with abalone population, it almost certainly has more to do with poaching than sport abalone hunters. That said, I don't really take issue with the new rules. It is such a great sport, and there is such a limited geography where the Red Abalone thrives, that it is important to protect the fishery. And if the DFW is erring on the side of caution with rules that are easier to enforce, I'm good with that. I've also learned it is even more important to turn in your abalone report card now. All the years I've been doing this I never failed to turn it in until last year. I lost mine (gotta be in a file somewhere), failed to report, and now I am in the system with a Bad Reporting Demerit. Don't be that guy.